So the next time some asshat says “There’s never anything to do in Sacramento,” I want you to remind them of today, Friday February 6. Not only is there something to do… there is altogether too much to do. For starters, there are three great rock and roll shows happening tonight. Orange County’s psych-garage maestros Thee Makeout Party (above) will stop by the West Capitol Bowl, joined by Nebraska’s Box Elders, Photobooth (featuring ex FM Knife Jason Patrone) and locals Beware of the Knight. You know this is going to be a great show when DJ Rick is skipping a Mayyors show to attend! Said Mayyors show is number two on our list– Sac’s current #1 buzz (both saw and press) band are dropping by the Funkassle (not Luigi’s Fun Garden as we erroneously printed in the Feb issue!) 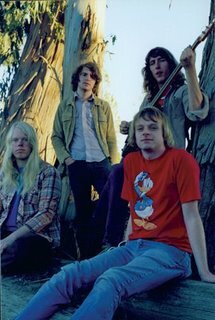 along with Death Sentence: Panda and new local faves Warm Streams (pictured). the Funkassle is a house party show, so be respectful (and check undietacos for details). Third up is a Java Lounge blowout featuring a KnockOffs reunion… this of course begs the question, “which lineup?” since the Knockoffs are sorta like Sac’s version of the Fastbacks, but we’re 99.9% sure it’s the longest running lineup (Big Tom, Lil Tom, Danny and Bobby). We’re 100% sure that it’s not KnockOffs beta (lil Tom, Alkali Flat Tim White, Rod ‘Trouble Makers’ Cornelius and Decibel Dean Seavers). Also on the bill is the aptly named Bastards of the Young who are doing their best to channel Tim era Replacements. there’s a couple more on the bill, but i can’t say I’ve heard ’em.